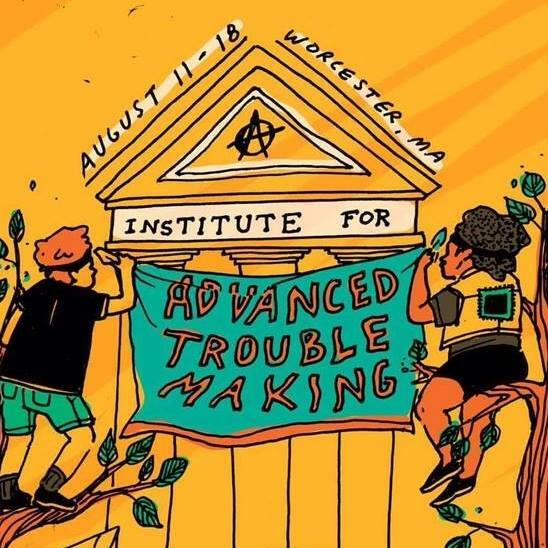 The Institute for Advanced Trouble-making is a week-long anarchist theory and action summer camp. Camp will take place from August 11th – 18th, 2017 in Worcester, MA. The I.A.T. aims to raise collective capacity to target our enemies at the systemic level with effective direct action and campaign work. As Trump’s presidency spurs a swell of anarchist organizing and renewed interest in anti-state anti capitalist perspectives, we want to escalate by building skills in direct action, creating movement infrastructure, and community organizing for new anarchists. We also want to bring experienced organizers together to innovate strategies and tactics for our contemporary context. Rather than an activism 101, our intention is to cultivate deeper understanding and praxis of anarchist organizing among people who are already doing some of that work.